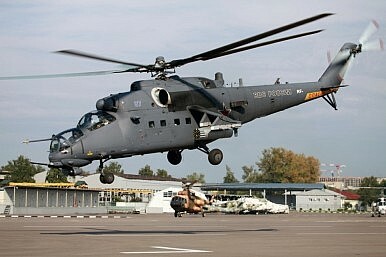 The Mi-35M gunships will replace part of Pakistan’s aging attack helicopter fleet. The Pakistan Army Aviation Corps (PAAC) took delivery of four Russian-made Mi-35M attack helicopters, Pakistan’s Defense Export Promotion Organization (DEPO) confirmed in a statement issued at this year’s International Military-Technical Forum (Army 2017), which took place August 22-27 in Moscow, according to local media reports. “The contract was signed, we received all four cars [Mi-35Ms] and now we get new equipment,” DEPOs Brigadier General Waheed Mumtaz told reporters in Moscow. PAAC are now getting acquainted with the new equipment. Based on the gunships’ performance a follow-up order for additional helicopters is under consideration, Mumtaz said. The general also noted that other Pakistani orders of Russian military equipment might take place depending on the Pakistani military’s experience with the helicopters. Russia officially lifted an arms embargo against Pakistan, in place since the Soviet-Afghan War, in June 2014. It is unknown in what configuration the helicopters were delivered. The gunship is fitted with a mounted twin-barrel GSh-23V 23 millimeter cannon, and can also carry 80 and 120 millimeter rockets, as well as anti-tank guided missiles. The Pakistan Army is specifically looking to enhance its close-air support capability for counter-insurgency operations as well as anti-tank warfare. The four helicopter gunships are slated for delivery next year.